Why are rowers so hospitable? Maybe because they know that it’s hard to find access to equipment when you are out of town. Maybe they want you to enjoy their home waters as much as they do. Maybe because there are relatively few people who do this sport and it’s great to come across others who love it, obsess about it, and speak the language. Hmm… we’re all fellow citizens of the virtual nation of rowing? I don’t know why I am always overwhelmed by this hospitality, but my recent outings with the Portage Lake Rowing Club in Houghton were no exception. I e-mailed Charles White and he immediately e-mailed me back and assured me they would find me a boat to go out in. Early Sunday morning a smiling group of 5 people trickled over to the dock on Isle Royale Sands. Everyone was so friendly and wanted to make sure I got the right boat and oars for the conditions. 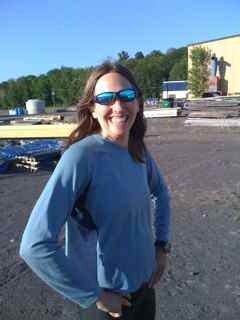 Dennis K. was even trying to offer me a skinnier single, but since the wind was very energetic and I was rowing in unfamiliar waters, I accepted Charles’ generous offer of his personal single while he and his wife Kirsten rowed beautifully in their double (nice matching, guys!) Watching Deb K. scull so masterfully in rotten weather for the two days in a skinny single the two days I was out an inspiration. Maybe in another 15-20 years I can look half as good as she does on the water. It has been a dream since I started rowing three years ago and found out about PLRC to row on the waters of my childhood. I am Copper Country born and raised, but have never gotten to experience going through the Canal under human power and looking over my shoulder. Even with boat-twisting winds, it was awesome! The blue sky, tree-covered hills and the distinctive landmarks kept me happy that I was not still in bed. I would have loved to be able to drag myself out of bed at least once to experience the much calmer waters of a 6 a.m. workout, but since that’s 3 a.m. in my home Pacific time, and there were many late night festivities at my sister’s house, I couldn’t pry my eyes open. If you haven’t been out with the club or tried rowing, I am telling you, give it a chance. PLRC has an incredible amount of coaching experience and talent for a small community rowing club in a place where it’s winter for half the year. Couple that with the greatest workout around and membership in a friendly “family,” and the only question that remains is: what are you waiting for? Thanks so much to everyone who made my visit so welcoming!